The purpose of Roman Catholic funeral services is to pray for the deceased and entrust them to God’s care, to honor the body, and to comfort the family and friends. Roman Catholic funerals are guided by a set of traditions that have comforted mourners for thousands of years. Since some of these traditions have changed over the years (for example, the approval of cremation and the corresponding way of respecting the cremated remains), your local priest is the best source of all information. In addition, Authorized Remembrance Providers will have detailed knowledge about specific considerations for conducting Catholic funerals and burials, and will be of great value in coordinating all aspects of the service. The following is intended to provide an overview and address certain key points as an introduction, and is based on information from the Archdiocese of Atlanta, the Diocese of San Diego, and the Diocese of Portland (referenced below) and other authoritative sites. Catholic funeral services, like all of its liturgy, are primarily worship of God. There are three formal components of the services: the vigil, the funeral Mass and the committal. The vigil is presided over by a priest, deacon, or prepared layperson (or member of the family) and generally consists of: introductory rite, liturgy of the word, intercessory prayer and concluding rite and blessing. The rosary, or a portion of it, may be included as part of the petitions within this rite, or preferably, it may be recited by the family at a time other than the vigil. The vigil services can be performed at the home or often at a wake, which is a gathering of family and friends often held at the funeral home so as to accommodate a significant group. The Catholic funeral service is called the Mass of the Resurrection. During it, Jesus Christ’s life is remembered and related to that of the deceased. Eulogies are not allowed during the funeral mass, but may be delivered at a wake or other non-religious ceremony. The committal service is perhaps the simplest and most powerful of the funeral services. In it the family and friends gather to take formal leave of the departed at the cemetery. Here the body is committed to the ground with the hope of eternal resurrection. At the committal, the reality of death and the hope in resurrection are simultaneously addressed. It is a gathering of the faithful for prayer. It is also appropriate for certain military or social rites to be performed at this ceremony. These rites should be arranged in advance with the priest so they do not detract from the formal liturgy. Traditionally, there is a procession from the church following the Mass to the cemetery where family and friends can participate in the final committal service. Your funeral director will be of great assistance in coordinating the procession and the rites at the cemetery or chapel. Many Catholic families are aware that the Vatican lifted the ban on cremation in 1963. The church prefers that the body be present at the funeral service and cremated afterwards. What many families are not aware of, however, is that the cremated remains must be treated with the same respect shown a deceased body. This means that the cremated remains must be interred, not scattered or kept at home. For the purpose of interment, cremated remains can be buried or placed in a mausoleum or columbarium. In all of these situations, monuments and memorials are appropriate and can be designed with special meaning to suit a family’s wishes. Catholic families have often made use of wakes, which are gatherings at the home or funeral home that can be held one or two days in advance of the formal funeral service as a way of saying goodbye to the loved one. At the wake it is typical for friends and families to offer condolences to the family of the deceased and often share special memories of their experiences with the loved one. It is also typical that the priest will lead prayers and a vigil service at the wake. Different ethnic groups have varied and specific traditions connected with the wake and your funeral director can be an advisor on what is appropriate. For many families the wake and the support of the family and friends can be a very important part of dealing with the grief that accompanies the death of their loved one. There is no special time constraint on how soon a Catholic funeral can be held. If the body is embalmed, the family can schedule a funeral in a way that allows them to reduce their stress by taking several days to plan the funeral, which also allows time for family members to travel to the funeral. 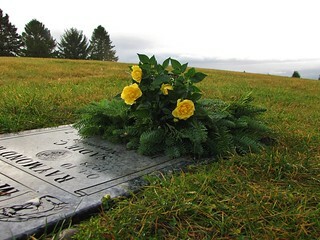 Authorized Remembrance Process funeral directors have pledged to help you as caregivers at this time, and can help you schedule a funeral service that best meets your individual family needs. Families can choose to have their funeral services at the funeral home chapel, at their church, or at the grave site. Many families choose to have services at all three of those locations. For example, the vigil and wake are held at the funeral home, the mass at the church, and the committal at the cemetery. The family and clergy generally choose which readings and hymns will be part of the funeral. Your priest and funeral director can provide you with a list of selections from which you can choose. The casket is usually draped with a white pall to symbolize Baptism of Christ. The Easter candle is placed near the casket to symbolize faith that the deceased may rise again with Christ. As part of the funeral Mass, the priest will deliver a homily that is specially shaped for this liturgy, and which includes references to scripture and is also designed to offer consolation to the family. Eulogies in Catholic funerals are traditionally given during the vigil/wake, during the committal or at a reception rather than during the funeral liturgy. Advice on creating a eulogy can be found here. Caskets for Catholic funerals can be made of wood or metal, and can be chosen to meet the specific desires of the family. It should be noted that there are a number of specific casket designs that capture religious motifs like The Last Supper or the Pieta, that are particularly appropriate for Catholic services. Urns are also available that capture designs uniquely appropriate for Catholic services.